A couple of students and I are researching ants. We have a series of questions we would like to know answers to and we were wondering if you could help us? – Where do ants come from? – What was the first ant species discovered? – What did the first ant species look like? – What did the first ants eat? – Is there an ant species that are extinct? – How and when were ants created? It would be appreciated if you could help us. Your questions are great ones, and it turns out that we are getting more and more information to help answer them all the time. I am no expert in this area, however. I will start the conversation and perhaps someone more current in the topic will stop by and clarify. 1. Where do ants come from? From your other questions, I assume you mean where did the first ants come from, and not where do new ants colonies that show up in your backyard come from. If I have misread your question, please let me know. 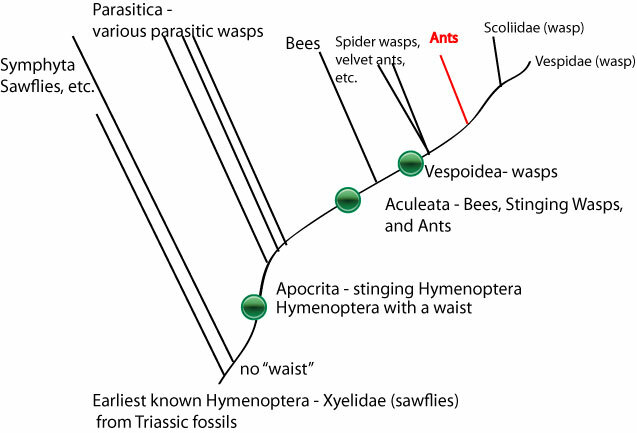 To answer, it is helpful to look at the “family tree” of the Order Hymenoptera. As you can see from this illustration, the ants are smack-dab in the middle of the wasps. Ants are essentially wasps with wingless workers that live in social groups. 2. What was the first ant species discovered? The first ants are thought to have shown up during the Cretaceous period, the time when the land was dominated by dinosaurs. Scientists examine fossils to piece together details of prehistoric life. It isn’t all that easy to find insect fossils, however, so they have to rely on insects trapped in deposits of amber (hardened tree resin). This lovely photograph of ants trapped in amber was taken by Mila Zinkova at Wikimedia. E.O. Wilson, Frank Carpenter and William L. Brown, Jr. (1967) described the first wasp-ant from mid-Cretaceous amber as the extinct species, Sphecomyrma freyi. They were not completely sure it was an ant because they couldn’t see whether it had a metapleural gland (a gland ants have on the sides of their mid-sections, but which wasps lack). Dave Grimaldi took up the challenge, and he and his colleagues verified Specomyrma freyi did have a metapleural gland and was indeed an ant. They also found a total of four genera and eight species in the extinct ant subfamily, Sphecomyrminae. The earliest are from French and Burmese amber. Armaniinae or Armaniidae – Extinct. Are they wasps or are they ants? No one knows for sure yet. As more early ants are found in amber, the beginnings of the Formicidae (ant family) will become clearer. 3. What did the first ant species look like? As alluded to above, the first ants most likely looked like wingless wasps. 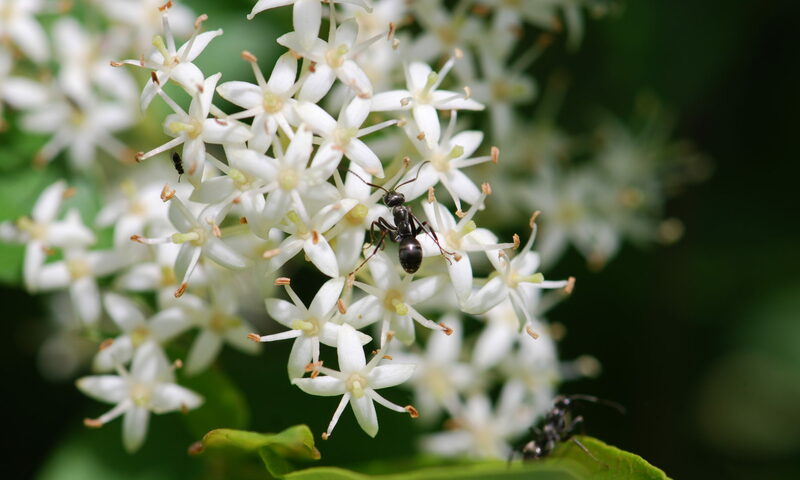 There are photographs of Sphecomyrma freyi available on the Internet, for example at The Ant Farm and Myrmecology Forum. Even if it isn’t the first ant, it was probably similar. Sphecomyrma freyi has characteristics of both ants and wasps. Ants are known for having “elbowed” antennae, that is the first segment attached to the head is long, forming the scape. The first segment of the antennae of Sphecomyrma freyi are slightly longer than in wasps, but not as long as that of modern ants. You can also see a drawing of Cariridus by downloading the full text of: Carlos Roberto F. Brandão, Rafael G. Martins-Neto, and M. Aparecida Vulcano. 1989. The earliest known fossil ant (first southern hemisphere Mesozoic record) (Hymenoptera; Formicidae: Myrmeciinae. Psyche 96:195-208 here. 4. What did the first ants eat? Most likely the first adult worker ants ate what wasps and adult worker ants eat these days, which is liquids. The presence of the thin “waist” makes it impossible for adult ants to eat solid foods. However, they would not have eaten nectar, at least at first, because flowering plants arose a bit later. The workers were likely predators that captured arthropods to feed to their larvae. The larvae may have given liquid food back to the adults once they had processed it. The adults might also have taken fluids from the prey. 5. Is there an ant species that are extinct? 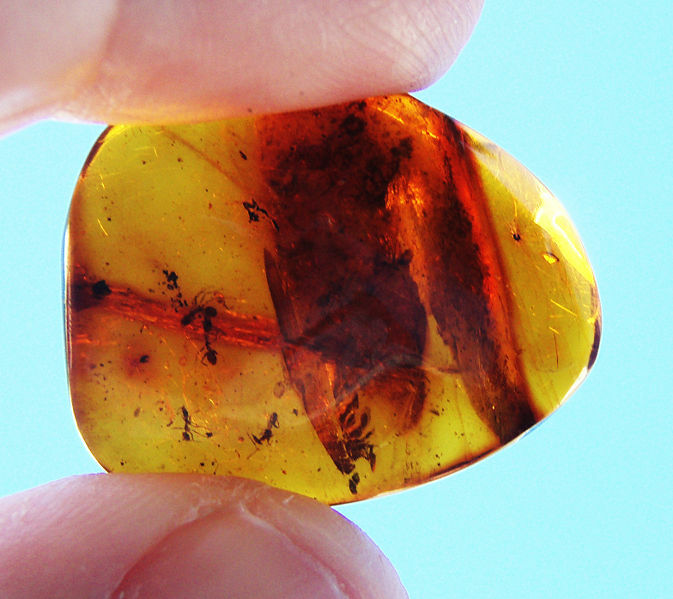 Yes, many of the species found in amber (question 2) are extinct, as far as we know. 6. How and when were ants created? Oh boy, that’s a tough question. When? The oldest fossils right now are from early to mid-Cretaceous, about 130 million years ago. How? Probably genetic modification from wasps already present. There are definitely people working on these sorts of questions. I’m not sure that what we know about the earliest ants is hard and fast yet. I hope this helps, and that the answer arrives in time to help with your project. Carlos Roberto F. Brandão, Rafael G. Martins-Neto, and M. Aparecida Vulcano. 1989. The earliest known fossil ant (first southern hemisphere Mesozoic record) (Hymenoptera; Formicidae: Myrmeciinae. Psyche 96:195-208. Can download here. Michael S. Engel and David A. Grimaldi. (2005). Primitive New Ants in Cretaceous Amber from Myanmar, New Jersey, and Canada (Hymenoptera: Formicidae). American Museum Novitates Number 3485 :1-24. Holldobler, B. and E. O. Wilson. 1990. The Ants. The Belnap Press of Harvard University Press, Cambridge, Mass. Excerpt. New Ant Species Discovered In The Amazon Likely Represents Oldest Living Lineage Of Ants. Science News. 2008. Lori Lach, Catherine Parr, and Kirsti Abbott, eds. 2010. Ant Ecology. Oxford University Press, USA, particularly chapters 1 and 2. They have common ancestry with vespoid wasps, including the social hornets, and many other solitary species, such as potter wasps. In addition to many anatomical features in common with these wasps that have been known for a long time, modern genetic studies reveal these wasps are ants’ closest genetic relatives. Do you mean what is the most ancient fossil ant known? If so, then the sphecomyrmines from French and Burmese amber deposits are the answer. They’re about 110 million years old. This is a big unknown, since the old ant fossils are fairly diverse themselves, as are the modern representatives of ancient lineages. But the wingless wasp images seems a good one. It is likely the first ants were predaceous and that they later acquired the taste for sweets. Typically, only adult ants eat a lot of sweets, while larvae are feed cut up prey animals. – Is there an ant species that is extinct? The age of the first ants is not known, but the best guesses are that the first animals we would recognize as ants evolved about 135 million years ago. Like all life, the group evolved and diversified from related, preexisting life, through accumulated genetic changes in their populations induced by natural selection. Not all the exact details of the natural selective forces are certain, but it would certainly seem that true social life with differentiated castes, loss of wings in the worker caste, division of labor among the castes, and secretion of anti-fungal substances from the metapleural gland all favored greater ability to utilize new niches for the wasp-like proto-ants. These features especially allowed them to live in soil, feeding on prey larger than themselves that belonged to groups of abundant invertebrates not eaten by many other predators of that time, such as centipedes, millipedes, and springtails. Yikes, sorry, lots of typos in the above. I need to proof-read before pressing “submit”, a good idea for all! Don’t worry about any typos. I have been thinking that I need to proof-read more carefully before I press “publish,” but sometimes there’s more numerous interruptions than words in the post, and things slip by. I will never be insulted if you correct my typos, Roberta (if that’s in your power). What has become of reading Tschinkel’s book? Or did you all finish it in my lapsus absentiae? As far as the Fire Ants book, do you want to see more? I did finish reading it. thanks but do you know How do ants reproduce? and What is the affect of temperture onants activity? Ants reproduce when the colony produces special ants that can become new queens, as well as males. The new queens have wings. You can see more about this in “What does a queen look like?” The new queens typically fly away from the nest, where they mate with the males from other colonies. This process is called swarming. In a typical ant species, the queens then go off and found a new colony, some by themselves, others in groups. You can read more about how new queens are produced here. As for the effects of temperature, because ants are insects, they are quite sensitive to temperature. In general they are more active when it is warmer. Each species has different temperature requirements. The temperature can also effect the ability of the larvae and other life stages to develop. See can larvae get too cold or hot. I was just thinking of writing a post about the effects of temperature on ants. If I get it together, I’ll come back here and add the link.